Yesterday’s post was of a bright sunrise. Today’s post is of a brilliant sunset over Limekiln Lighthouse on San Juan Island. Several people just hung around the lighthouse until the last rays of the sun receded. The day was another wonderful gift! 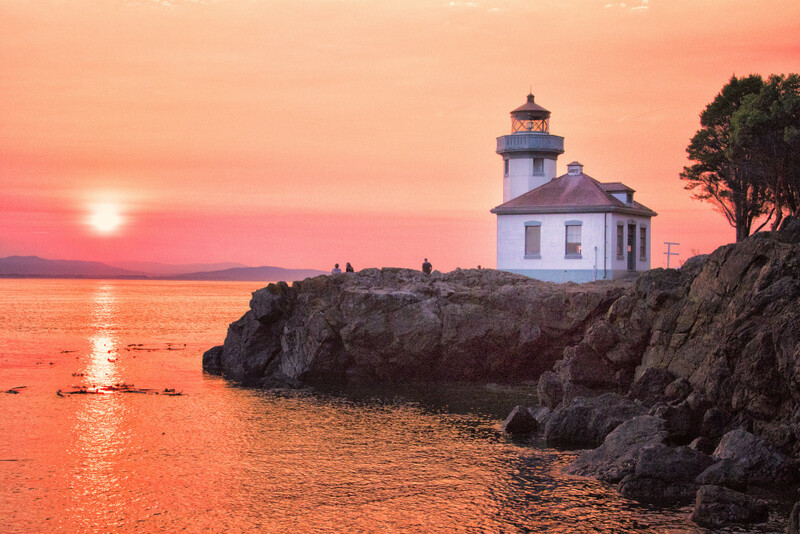 This entry was posted in The Grand Landscape and tagged Landscape, lighthouse, San Juan Island, sunset, Washington. on August 23, 2015 by kgrafphoto. It was a dark and dreary morning at the Anacortes ferry dock. The sun broke through the clouds to display its golden rays behind Mt. Baker. Even though it was raining at the dock, I felt that it was going to be a beautiful day. By the time we reached Friday Harbor, the clouds had burned off and the sky was bright blue. It was a beautiful day. Each day is a gift!!! This entry was posted in The Grand Landscape and tagged Anacortes, Landscape, Mountains, Mt. Baker, sunrise, Washington. on August 22, 2015 by kgrafphoto.